Precision stainless steel woven wire cloths in 50 to 400 mesh size. Made from thin 304 stainless steel wire, which offers good mechanical strength, abrasion resistance and excellent chemical properties. Suitable for sifting, filtration and immersion applications. Used in sample preparation, sorting, and prototyping in laboratories and shops. Available in 6" (150mm) squares (sold in packs of 2) or 12" (300mm) squares. Can be cut to size with metal sheers; (see "Miracle" Universal Scissors ). These precision screening cloths are woven with monofilament fibers (single threads) with accurate diameters, resulting in a mesh with precise openings that resist clogging and are easy to clean. 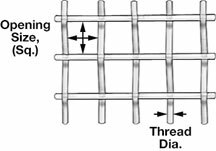 Mesh screening is suited for sifting, straining, filtration and immersion applications. Used in sample preparation, sorting and prototyping in laboratories and shops. Available in handy precut 12"x12", 6"x6" and 3"x3" pieces or larger pieces form a roll with a minimum length of 3 ft. The roll can vary in width from 40" to 58" depending on mesh and/or material. Nylon mesh is more abrasion resistant than polyester. Can be gamma, steam and ETO sterilized. Maximum temperature is 235°F (113°C). Color is opaque to translucent white. Polyester mesh a better strength in wet conditions than nylon. Maximum temperature is 260°F (127°C). Color is opaque to translucent white. Polypropylene mesh offers good strength and stability and is highly resistant to acids, alkalis and other chemicals. Excellent for working with materials that bind up most metal screens. Maximum temperature is 194°F (90°C). Color is opaque to translucent white. Fluorocarbon screens are made from ETFE (Ethylene-co-Tetra-Fluor-Ethylene) and offer excellent chemical resistance, high strength and self-cleaning properties. Can be used for cryogenic applications. Working temperature range is -300ºF to 300ºF (-185ºC to 150ºC). Color is opaque to translucent white. 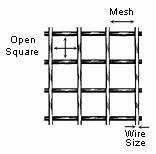 Material Mesh Mesh Openings per sq. inch Thread Dia.